LOUDOUN, a surname derived from Law-dun, a barony in Ayrshire, both syllables meaning the same thing, namely “the hill,” the round conical elevation in the south-west extremity of the parish being of the class which the Scoto-Saxon called law, and the Scoto-Irish dun. It is famous for two battles, one of them called the battle of Loudonhill, fought in 1307, between Robert the Bruce and some English troops under the earl of Pembroke, and the other, fought near it in 1679, known as the battle of Drumclog. “Loudoun’s bonny woods and braes” are the subject of one of Tannahill’s most popular songs. In the parish of Loudoun are the ruins of Loudoun castle, destroyed in the 15th century by the clan Kennedy, headed by their chief, the earl of Cassillis. It was the seat of the Loudons of Loudon, one of the oldest families in Scotland. In the reign of David I. (1124-1153) the proprietor of the lands and barony of Loudoun was named Lambin. During the reign of William the Lion (1165-1214) James de Loudoun dominus de eodem, obtained a charter of the same from Richard de Morville, constable of the kingdom. Jacobo filio Lambin, also obtained a charter from William de Morville, as Jacobo de Loudoun, terrarum baroniae de Loudoun. His daughter, Margaret of Loudoun, married Sir Reginald Crawford, high-sheriff of Ayr, and was the grandmother of Sir William Wallace, the heroic defender of the liberties of his country. In later times a branch of this old family settled in Livonia, from which descended Field-marshal (in the Austrian service) Gideon Ernest, Baron Landohn, born at Tootzen, in Livonia, in 1716, died in Moravia, July 14, 1790, one of the greatest generals of the 18th century. LOUDOUN, earl of, a title in the Scottish peerage, conferred in 1633, on Sir John Campbell, high-chancellor of Scotland, descended from Sir Duncan Campbell, who married Susanna Crawford, heiress of Loudoun, in the reign of Robert I. He was the son of Sir Donald Campbell, 2d son of Sir Colin More Campbell of Lochaw, ancestor of the dukes of Argyle. His wife, Susanna Crawford, was 5th in descent from Sir Reginald Crawford, heritable sheriff of the county of Ayr, and Margaret de Loudoun, daughter and heiress of James de Loudoun above mentioned. Sir John Campbell, first earl of Loudoun, was the eldest son of Sir James Campbell of Lawers, of the family of Glenurchy. He was knighted by King James VI., and in 1620 he married Margaret Campbell, baroness of Loudoun, whose grandfather, Sir Hugh Campbell of Loudoun, sheriff of Ayr, was sworn a privy councillor, and created a lord of parliament by the title of Lord Campbell of Loudoun, 30th June 1601. In consequence of this marriage Sir John was styled Lord Loudoun. He was created earl of Loudoun, and Baron Tarringean and Mauchline, by patent, dated 12th May 1633, but in consequence of his opposition to the measures of the court, the patent was, by a special order, stopped at the chancery, and the title suspended till 1641. In 1637 he distinguished himself by his active resistance to the ill-judged and unconstitutional attempt of Charles I. to force episcopacy upon Scotland. He was a member of the famous Glasgow Assembly of 1638, as elder for the burgh of Irvine, and was selected as one of the assessors to the moderator, when he displayed great learning and zeal. In the following year he took the castle of Strathaven, and those of Douglas and Tantallon, and garrisoned them for the Convenanters. He was one of the commissioners from the Scots army who settled the pacification of Berwick with Charles I. the same year. Soon after he was, with the earl of Dunfermline, sent by the Scots Estates to London to put the king in possession of the proceedings in parliament, then recently prorogued, when they returned to Edinburgh. 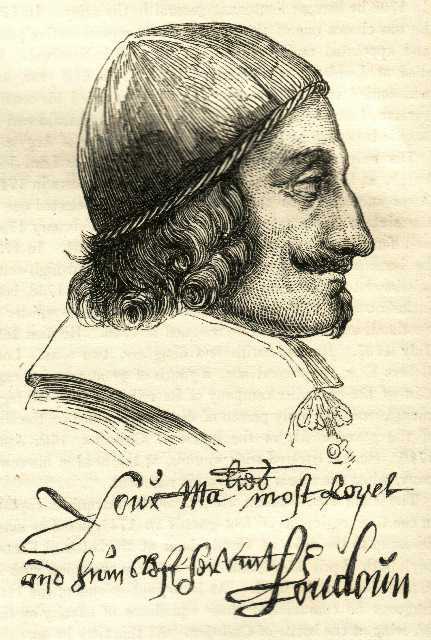 On the 19th January 1640, he was one of the commissioners sent by the committee of Estates a second time to the court at London, when he was arrested, on a charge of treason, by order of the king, on account of an intercepted letter, signed by him and six other Scots noblemen, addressed to the king of France, imploring his assistance. This letter seems to have filled the court with great consternation, as it was mentioned in the king’s speech from the throne, on the opening of the English parliament, and read to the members. On being brought before the English privy council, his lordship refused to give any account of the letter except that it was never sent, and that he ought to be questioned for it in Scotland and not in England. He was committed to the Tower, where, after remaining some time, he was visited by the marquis of Hamilton, through whose influence with the king he at last obtained his liberty. After being introduced by the marquis at court, and kissing the king’s hand, he returned to Scotland, and in gratitude to Hamilton for having thus contributed to save his life, he procured him the good will and esteem of the Covenanters. In August of the same year he commanded the van of the foot of the Scots army at the battle of Newburn, and was one of the commissioners for the treaty of Ripon. On 15th July 1641 he presided at the opening of the Scots parliament. When the king visited Scotland in the following month, he had his title of earl allowed, with precedency from 1633, and was appointed high-chancellor of Scotland, and first commissioner of the treasury, with a yearly pension of £1,000 sterling. With the earls of Lauderdale and Lanark, he was sent to treat with the king when a prisoner in Carisbrook castle, Isle of Wight, in 1647, and on the 15th February 1648 he laid before the committee of Estates the concessions to which the king had acceded. On the meeting of the Scots parliament on March 2d the earl was elected president. He at first concurred in “the Engagement” for the king’s relief, but withdrew his support from it when he found it opposed by the church, and even submitted to a public rebuke and admonition, in the High church of Edinburgh, for having at first approved of it. His portrait and autograph are subjoined. After the defeat of the Scots army at Preston, and the advance of a force under the earl of Lanark to the borders, the Presbyterians of the west, to the number of 6,000, with the Chancellor Loudoun and the earls of Eglinton and Cassillis at their head, marched towards Edinburgh, to prevent any assistance being given to the king. He was a principal promoter of the passing of the act of Classes, by which all who were favourable to the Engagement were excluded from offices of trust and from parliament. When the marquis of Montrose was brought to the bar of the parliament house to receive sentence, he was bitterly reviled by the Chancellor Loudoun. After the defeat of Charles II. at Worcester in 1651, he returned to the Highlands, and in 1653 joined the earl of Glencairn, who then took up arms in the royal cause. He soon, however, left that nobleman and retired into Athol. He and his son, Lord Mauchline, were excepted out of Cromwell’s act of grace and pardon in 1654, by which £400 a-year was settled out of his estates on his countess and her heirs. He afterwards submitted to General Monk. At the Restoration he was deprived of his office of chancellor, and fined £12,000 Scots. He died at Edinburgh, 13th March 1663. His son, James, second earl, lived abroad, and died at Leyden in 1684. Hugh, third earl, his eldest son, by Lady Mary Montgomery, second daughter of the seventh earl of Eglinton, was sworn a privy councillor in April 1697. The following year he became a candidate for the office of extraordinary lord of session, on which occasion the earl of Argyle, in two letters, strongly recommended him to Secretary Carstairs. In one of these, dated 27th September that year, he says, “Pray, let not E. Melville’s unreasonable pretending to the vacant gown make you slack as to E. Louden, who, though a younger man, is an older, and a more noted Presbyterian than he. Loudoun has it in his blood, and it is a mettled young fellow, that those who recommend him will gain honour by him. He has a deal of natural parts and sharpness, a good stock of clergy, and, by being in business, he will daily improve.” He in consequence obtained the appointment, and took his seat on the bench 7th February 1699. After the accession of Queen Anne, he was, in 1703, sworn one of her privy council. In 1704, he was appointed one of the commissioners of the treasury, and made a knight of the Thistle. In the following year he was appointed joint secretary of state for Scotland, and named one of the commissioners for the Union. Having resigned his titles into the hands of Queen Anne, she restored them to him and his heirs male, whom failing to his heirs whatsoever, by patent, and a charter under the great seal, dated 8th February 1707. The office of secretary having been abolished, his lordship was appointed in May 1708, keeper of the great seal of Scotland, by patent, during the queen’s pleasure, with a pension of £2,000 per annum, besides the emoluments of the office. This appointment he was deprived of in 1713, in consequence of not complying with some of the measures of the Tory administration. On the accession of George I. in 1714, he was again sworn a privy councillor, and in 1715 appointed lord-lieutenant of Ayrshire. He served as a volunteer, under the duke of Argyle, at the battle of Sheriffmuir, where he behaved with great gallantry. He was lord high commissioner to the General Assembly in 1722, 1725, 1726, 1730, and 1731. In 1727 he had a pension of £2,000 per annum settled on him for life, and was one of the sixteen Scots representative peers from 1707 till his death, which took place 20th November 1731. His countess, Lady Margaret Dalrymple, only daughter of the first earl of Stair, greatly improved the grounds around her residence at Sorn castle in ayrshire, where she died 3d April 1777, in her hundredth year. Their only son, John, fourth earl, a distinguished military officer, was one of the Scots representative peers for the long period of 48 years. He was appointed governor of Stirling castle in April 1741, and aide-de-camp to the king in July 1743. In 1745 he raised a regiment of Highlanders for the service of government, of which he was appointed colonel, and on the breaking out of the rebellion of that year he joined Sir John Cope, under whom he acted as adjutant-general. He was at the battle of Preston, after which he went north, in the Saltash sloop of war, with arms, ammunition, and money, and arrived at Invernesson the 14th October. By the middle of the following month he had collected more than 2,000 men. To relieve Fort Augustus, which was blockaded by the Frasers, under the master of Lovat, he left Inverness on the 6th December with 600 men, and passing through Stratherrick during a very severe frost, reached Fort Augustus without opposition. Having supplied the garrison with everything for its defence, he returned to Inverness on the 8th, and on the 10th marched to Castle Downie, the seat of Lord Lovat, whom he prevailed upon to go with him to Inverness, and to live there under his own eye, until all the arms of the clan Fraser were delivered up. As some delay took place in their doing so, Lord Loudoun placed sentries at the door of the house where Lord Lovat resided, intending to commit him to the castle of Inverness next morning, but he escaped during the night. In February 1746, Lord Loudoun formed the design of surprising Prince Charles at Moy castle, the seat of the chief of the Mackintoshes, which ended in the celebrated rout of Moy. Finding, soon after, that the prince was advancing upon Inverness, his lordship retired into Ross-shire, when first Lord Cromarty, and then Lord George Murray, and subsequently the duke of Perth, were despatched against him. In the meantime he had crossed the firth of Dornoch into Sutherland, and upon reaching the head of that county, he separated his army. Accompanied by the lord-president, Forbes of Culloden, and the laird of Macleod, he marched to the sea-coast with 800 men, and embarked for the Isle of Skye. The dispersion of his army was considered of such importance by charles that he immediately sent an officer to France with the intelligence to his father, the chevalier St. George. In 1756, the earl was appointed captain-general and governpr-in-chief of the province of Virginia, and on 20th March of the same year he was constituted commander-in-chief of all the British forces in America. Great Britain declared war against France in May, and on the earl’s arrival in New York on 23d July, he repaired immediately to Albany, the seat of government of the state of New York, to take command of the forces assembled there. In August the French made themselves masters of Forts Oswego and Ontario. Having on 3d January 1757 laid an embargo on all outward bound ships, for the purpose of concealing his plans as to the contemplated siege of Louisburn, and afterwards wasted the time of the army at Halifax, instead of proceeding to active operations, a clamour was raised against him at home, and in the following December, he was recalled from America. He was second in command, under Lord Tyrawley, of the British troops sent ot Portugal, in February 1762, when spain declared war against that country. He died 27th April 1782, in his 77th year. At the time of his death he was colonel of the 3d regiment of foot-guards, a general in the army, governor of the castle of Edinburgh, a privy councillor, one of the Scots representative peers, F.R.S., and the third field officer in the army. Although so much occupied abroad, he paid great attention to the improvement of the grounds around Loudoun castle in Ayrshire, which was one of the first places in the west of Scotland where foreign trees were planted. “John, earl of Loudoun,” says Dr. Walker, “formed at Loudoun castle, the most extensive collection of willows that has been made in this country, which he interspersed in his extensive plantations. Wherever he went, during his long military services, he sent home every valuable sort of tree that he met with. All the willows he found cultivated in England, Ireland, Holland, Flanders, and Germany, as also in America and Portugal, where he commanded, were procured and sent to Loudoun.” As he died unmarried, the title devolved on his cousin, James More Campbell, only son of the Hon. Sir James Campbell of Lawers, third and youngest son of the second earl of Loudoun. Sir James, having early entered the army, served under the duke of Marlborough. At the battle of Maiplaquet, 11th September 1709, being then lieutenant-colonel of the Scots Greys, at the head of a party of his men he attacked the French, and cut his way through the midst of them, and then returned by the same way. This sally is said to have greatly determined the victory on the side of the allies. Being contrary to rule, however, he exposed himself to censure by it, but Prince Eugene of Savoy, the commander-in-chief, the day after the battle, returned him thanks in the face of the army for exceeding his orders. He got the command of the Scots Greys, 15th February 1717, and was appointed one of the grooms of the bedchamber to George II. In 1727 he was elected M.P. for Ayr, and in 1738 constituted governor of Edinburgh castle. At the battle of Dettingen, 16th June 1743, his courage and conduct were so conspicuous that George II. invested him with the order of the Bath at the head of the army. At the battle of Fontenoy, 30th April 1745, he commanded the British horse, but was mortally wounded, one of his legs being taken off by a cannon ball. Dying soon afterwards, he was burned at Brussels. He married Lady Jean Boyle, eldest daughter of the first earl of Glasgow, by his second wife, Jean, daughter and heiress of William Mure of Rowallan, and had, with a daughter, one son, James Mure Campbell of Lawers, who succeeded his cousin in the earldom. James, fifth earl, assumed the name of Mure, on succeeding to the estate of his grandmother, the countess of Glasgow. In 1754 he was elected M.P. for Ayrshire, and attained the rank of major-general in the army, 19th October 1781. He died 28th April 1786, in his 61st year. He had married, 30th April, 1777, Flora, eldest daughter of John Macleod of Rasay, Inverness-shire, and by her had an only child, Flora Mure Campbell, countess of Loudoun, in her own right, born in 1780, died in 1840. She married, 12th July, 1804, Francis Rawdon Hastings, earl of Moira in Ireland, then commander-in-chief of the forces in Scotland, created marquis of Hastings, 7th December 1816, and, with three daughters, had a son, George Augustus Francis, second marquis of Hastings and sixth earl of Loudoun. Of the amiable, accomplished, and unfortunate Lady Flora Hastings, the eldest daughter, a memoir is given earlier. The second marquis of Hastings had, by his marchioness, Barbara Yelverton, Baroness Grey de Ruthyn, two sons and four daughters. Paulyn Reginald Serio, third marquis of Hastings, and seventh earl of Loudoun, an officer in the army, was drowned at Liverpool, 17th January 1851, in his 19th year. He was succeeded by his only brother, Henry Weysford Charles Plantagenet, fourth marquis of Hastings and eighth earl of Loudoun, born 22d July 1842.